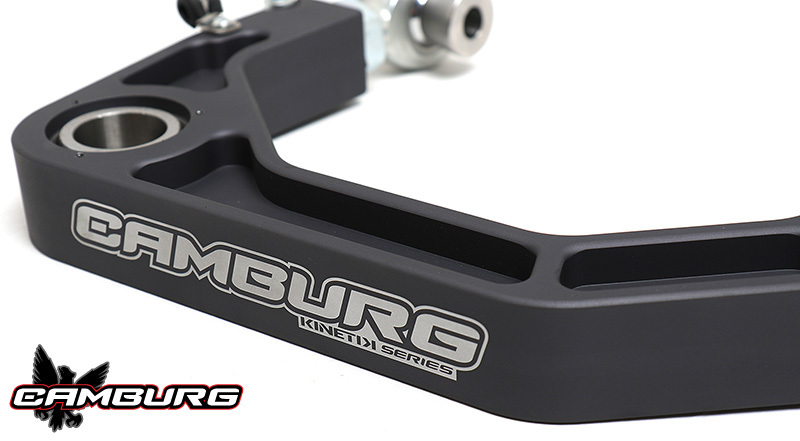 We’re proud to release our new line of Camburg KINETIK Series billet upper control arms for the 2004-19 Ford F-150’s. Countless hours were spent designing and refining these arms to the point where they met our high standards. 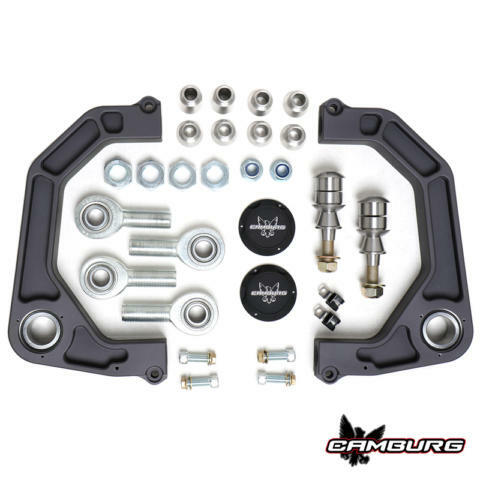 CAD designing and machining gave us the ability to bring some new design elements and features to the table. We CNC machine these from aerospace quality 6061 billet aluminum, then send them out to be bead blasted, Type II anodized gun metal gray and have our Camburg logo laser etched. 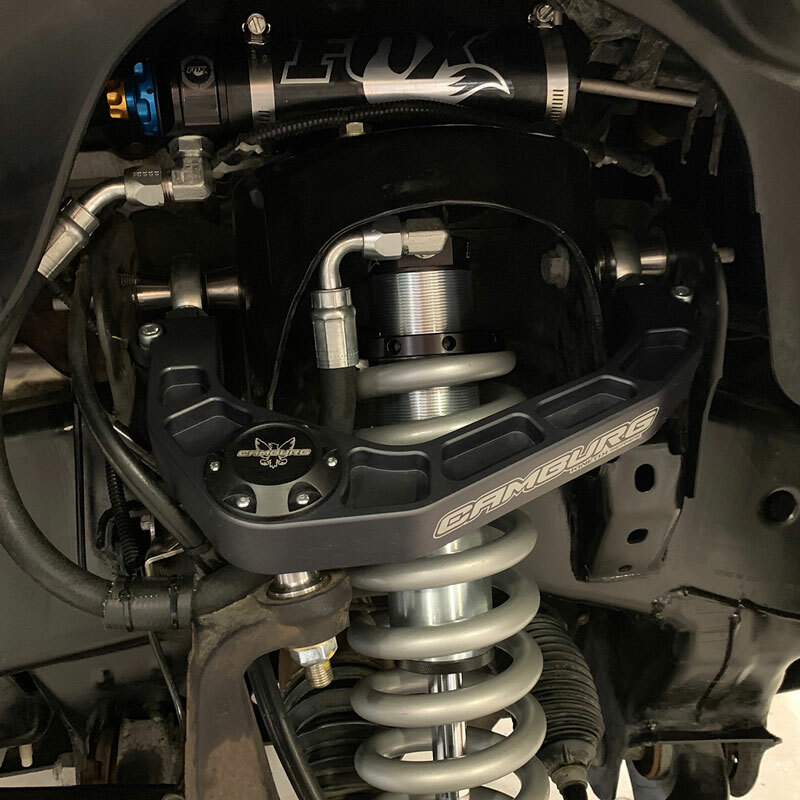 Like our tubular arms we use a larger FK 1.25” uniball that has a PTFE liner for increased strength and mis-alignment for maximum useable wheel travel. Made in the USA these are far superior to the cheaper and smaller imports other companies use. Adapting the uniball to the spindle/knuckle is done using model specific spacers that match the factory taper precisely. 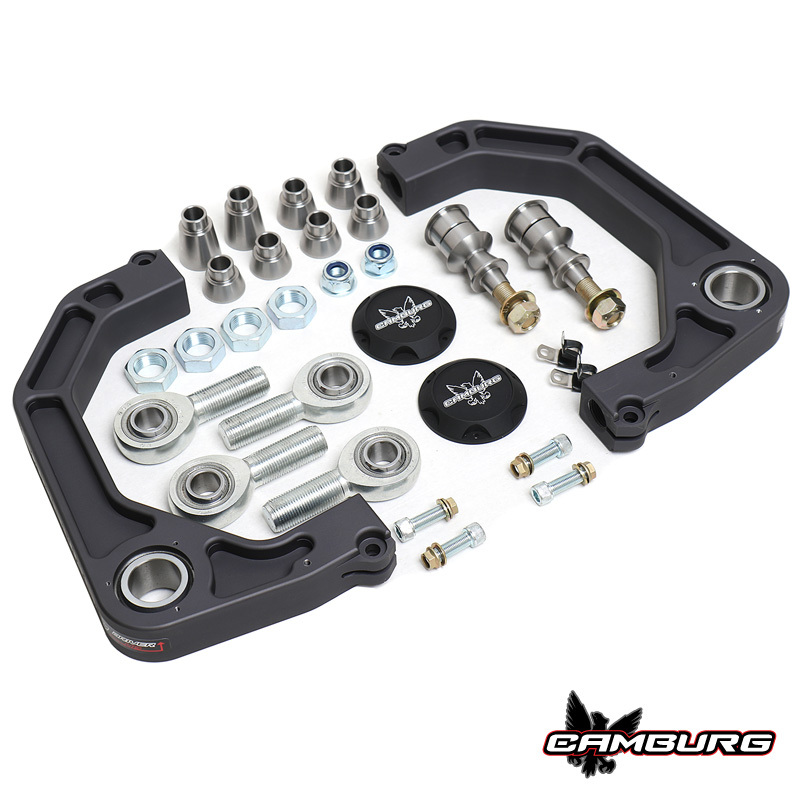 These are machined from heat-treated stainless steel and are a one piece design for increased strength. No drilling or modifications are needed. The 1.25” uniball gives us the ability to run a larger and stronger 9/16” 12 point bolt with a low profile bolt-on uniball cap to resist the elements. 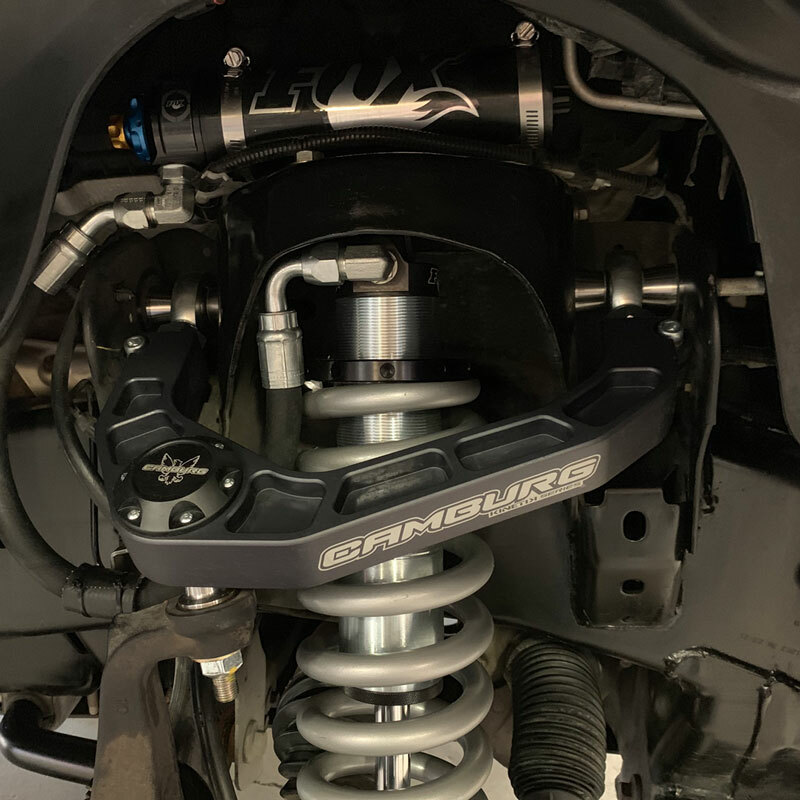 Using larger and stronger FK 7/8” chromoly heim joints allows for additional camber and caster adjustment if needed with larger 6” suspension kits or damaged frames. 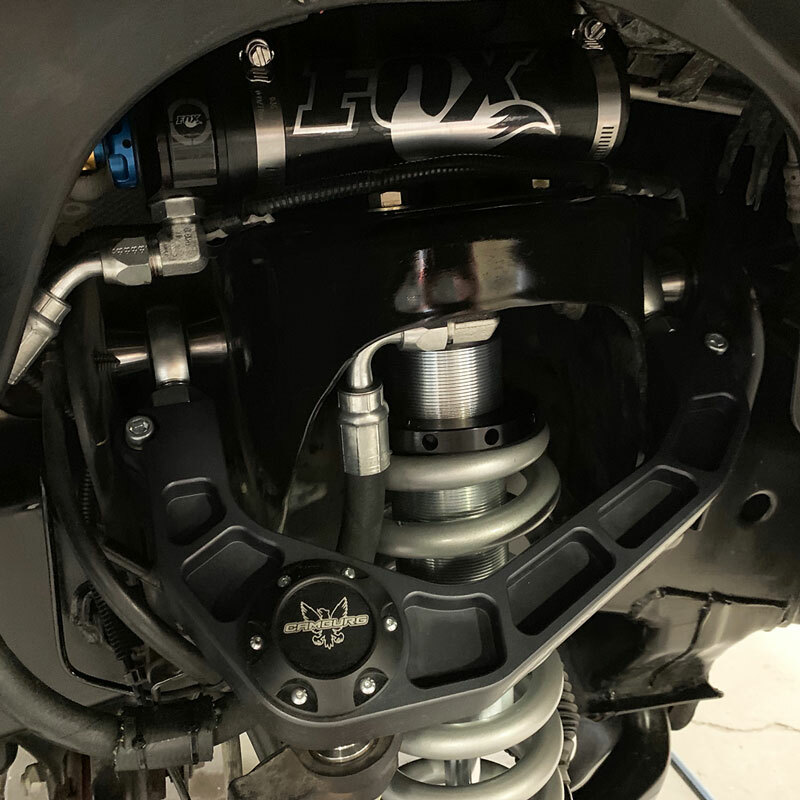 Using a heim joint also eliminates flexing/deflection under hard use and braking with zero binding when in use. 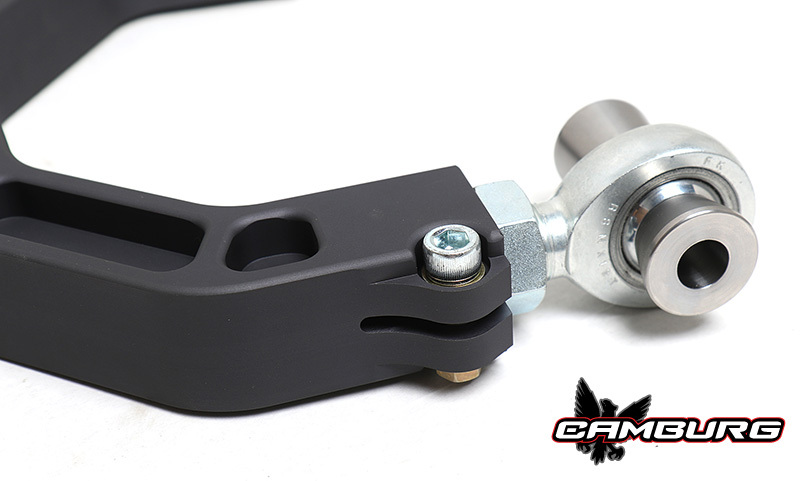 Using AN/Mil-spec hardware we have a single pinch bolt and secondary jam nut to insure the heim is secure with the rigors of off-road use. When running 35″ tires you need a zero offset wheel so the tire doesn’t rub on the upper arm at full turn. When running a 33″ tire you can run a +18 positive offset wheel for better tire clearance at the fender. Tire size is dependent on how much lift is achieved from coilovers.